Follow this free pattern and learn how to crochet a classic granny square to use for blankets, pillows, stuffed animals, and more! You may have noticed that aside from sharing a few things on social media, I’ve been MIA since my peach-strawberry smoothie recipe post in September. I truly apologize for my absence; my first semester of teaching was busy, stressful, and kind of terrible. So much so that I’ve actually left my teaching position, and will be taking the spring semester off… well, off-ish. I’ll still be blogging, tutoring, and substitute teaching — just not working full time. This decision is partly because I need a break to regroup and rediscover my passion for teaching, but also because we’ve recently learned that we’ll soon be starting our next adventure in Denver, Colorado! I’ve never been there, but Denver has been on my “next big move” list since I graduated from college, and the hubs and I were considering looking for jobs there after he finished his doctorate program. Everyone I talk to tells me that Denver is amazing, and I can’t wait for mountain views, snow, and city life! Leaving North Carolina is bittersweet; the mild winters have weakened my cold tolerance and made outdoor running season nearly year-long (It was 65 degrees yesterday — whaaa?!?! ), living between the Appalachians and the Outer Banks has spoiled me (farewell easy beach weekends! ), our rent is filthy cheap, and our NC friends will be sincerely missed. Regardless, I’m excited to pack up the U-haul and begin the journey west. I’m also so thrilled to have extra time to dedicate to the You Should Craft blog and my lovely readers! Keep up with all the newest posts and Follow my blog with Bloglovin! Don’t worry compadres, I’ve been able to squeeze in some cooking and crafting this semester, and over the next couple weeks I’ll be sharing my most recent projects and recipes. If you’ve been following me on crochet blanket I’m working on right now (shown above). I’ll be sharing the tutorial in a series, starting with today’s post about how to crochet the classic granny square! Be sure to follow You Should Craft on joining the squares as-you-go and the final pattern and border. Love granny squares?! 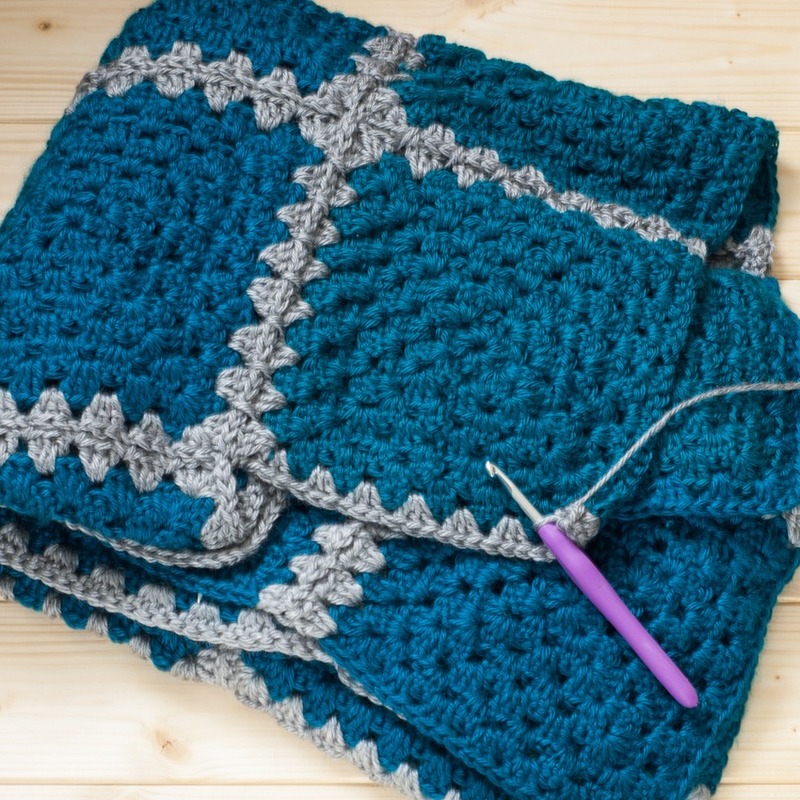 Download a FREE 2-page printable PDF version of the Granny Square Contrast Blanket pattern! Click here for the FREEBIE! Begin by chaining 4. I used my gold yarn from Big Twist that I picked up on sale at JoAnn Fabrics. I had never used Big Twist before, but I enjoyed using it and loved all of the color options they had at JoAnn’s. Sidebar: Big thanks to my mom for buying me new crochet hooks! I’ve been using the same aluminum hooks since like 5th grade, but my mom got me a set for Christmas that comes with the ergonomic comfort grip. I had to get used to crocheting with a wider grip, but once you get the hang of it they’re so much more comfortable, especially for long crochet sessions (aka marathons of The Wire on Amazon Prime). The madre bought me the set that comes with a cute little case and a couple extras, but you can also buy the same set sans case. Round 1: Connect with a slip stitch (sl st) to create a ring. Chain (ch) 2. Crochet 2 double crochet (dc) into the center of the ring, ch 1, *3 dc, ch 1* (repeat 2 more times). Connect to first dc (not top of the chain) with a sl st. Round 2: Ch 2, turn. 2 dc into space below ch, ch 1, 3 dc into space. This will create your first of four corners. Below next chain (in the gap between the 3 dc clusters) crochet *3 dc, ch 1, 3 dc* (repeat 2 more times, for a total of four corners). Connect to the first dc with a sl st. Some people stop after the second round, for super cute teeny granny squares. Continue or not, the choice is yours! I chose to attach my charcoal gray yarn here for the third round, but you could continue in the original color. Granny squares can be anything you want them to be, so get creative! You could stop here if you want, but I’m going to keep going. I used a bigger hook and 2 chains in each corner, but this is where I stopped for the squares in my Mario mushroom blanket that I posted on Thrifty Below. It took me about 3 years to make all 256 of the granny squares, but it turned out so cute! You can make your granny squares as big as you want, just by following the same pattern of 3 dc in the side spaces and 3 dc, ch 1, 3 dc in each corner. For the contrast blanket I’m working on right now, I made seven-round squares that end up measuring about 6.5 inches wide. Finishing Off: Some people finish off their granny square with a slip stitch and then weave in the ends, but I like to do a seamless join. First, you’ll cut your yarn (leave a 6-ish inch tail) and pull it all the way through the top of the last stitch (no more crochet loop). Next, you’ll thread your tapestry needle and pull it through both loops of the first dc you crocheted (skipping the ch 2). Finally, carefully put the needle between the top loops of the last dc you crocheted, and begin weaving the tail through the dc. Gently pull the yarn tail until the joining point looks the same as the tops of the other stitches. Weave in the rest of the tail and trim. Set the granny square aside and make a whole bunch more. There are so many amazing projects you can crochet with these classic granny squares — pillows (perhaps the Sunburst Pillow will give you some inspiration? ), blankets (stay tuned for the next post in the contrast blanket tutorial series! ), stuffed animals… the list goes on. You can keep the squares solid, change colors with each round, make designs or 8-bit images… leave a comment below to let me know what you’ll be making with your classic granny squares! This is awesome! I’ve always had a hard time with knitting. Maybe I’ll have a more relaxing time with crocheting, lol. Give it a try and let me know how it goes, Sarah! I find crocheting really relaxing, especially if it’s an easy, repetitive pattern. Such an easy tutorial to follow. This is going to be so pretty! Glad to hear you think so, Deb! If you come back next week I’ll show you how to make an afghan with your granny squares!